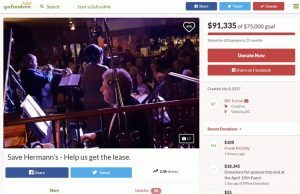 The Arts on View Society have raised the funds required to lease and operate and effectively save Hermann’s Jazz Club. The Victoria non-profit signed an agreement in early March to operate Hermann’s for the next five years contingent on raising $75,000 for a deposit and venue improvements by April 15, 2019. As of Saturday April 13, the society have received $91.335 in donations, surpassing their goal by $16,000. A fundraising concert held Wednesday April 10 pushed them passed the finish line with more than $18,000 raised. Turner said that because the Arts on View Society is designed to be a charity, it will also be able to implement programs for musicians and students sooner with the extra money. The society are still accepting donations on their Gofundme campaign or monthly pledges on their website.